Oracle Ascend (If you control ten or more permanents, you get the city's blessing for the rest of the game.) Snubhorn Sentry gets +3/+0 as long as you have the city's blessing. 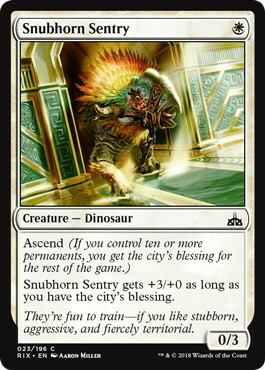 Flavor Text They're fun to train?if you like stubborn, aggressive, and fiercely territorial.